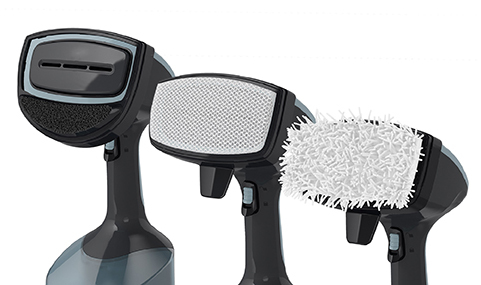 Erasing wrinkles from clothing and freshening up fabrics is a breeze with the BLACK+DECKER Advanced Handheld Steamer. With 1400 watts of power and a preheat time of less than a minute, this steamer delivers quick and effective wrinkle-fighting performance, producing 45% more steam than the Conair GS23 Series*. 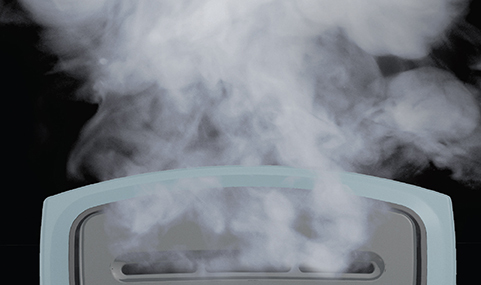 Lock the steam trigger into place to release a continuous flow of steam that melts away wrinkles in no time. The 220mL (7.4oz) water tank is removable for easy filling. Use the included attachments for special jobs: upholstery, delicate fabrics and lint removal. 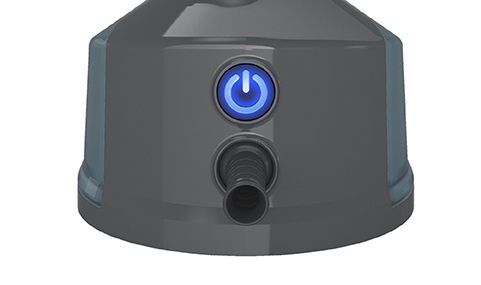 Operation is intuitive with an indicator light for power, preheat, and auto shutoff modes. Advanced Handheld Steamer is rated 4.3 out of 5 by 53. Rated 5 out of 5 by Cubist from Perfect for quilters I bought this for my wife to use in her quilting studio. She steams bits of fabric and quilt squares on an almost daily basis, but it's usually small jobs where it's just not convenient to drag out a large steamer. This handheld steamer is lightweight, heats up quickly and has an auto-off feature which is a nice feature. It doesn't require a lot of space and is ready right there when and where she needs it. It's working out really well. Rated 1 out of 5 by Terri D from just bought and not working i bought this two days ago- just plugged in and nothing happening! and the dang thing wont turn off! Help! Rated 5 out of 5 by whiskeywoo from Awesome This lightweight steamer is such a time-saver because it’s easy to refill and heats up quickly. I also find that it doesn’t leak like some of the other steamers I’ve had in the past which is great. Rated 1 out of 5 by Allen from Does not work I purchased this item about months before I pulled it out the box. I did everything the instruction and the yahoo tube videos say to do and nothing come out. It's get hot but it seems like the water is not coming through. Rated 1 out of 5 by BruceJr from I'm sure it works great, but it doesn't work Right out of the box it is not working. I followed all the directions to a T but the iron is not producing any steam.